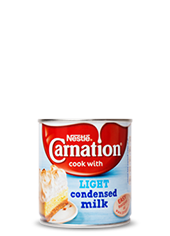 Carnation® Caramel is a no-fuss filling for Banoffee Pie, ready-made, authentic Dulce de Leche caramel that you can spoon straight from the tin. Or why not try swirling into our muffin recipes! 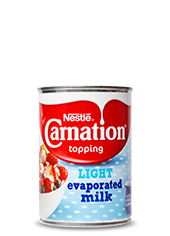 Carnation® Caramel is made with no added colours and contains no artificial flavours or preservatives. Available in a 397g tin, it’s a versatile ingredient for all home bakers. Remember, our can is 'Easy Open', so always use the ring pull. Caramel – Banoffee Filling! is rated 5.0 out of 5 by 145. Rated 5 out of 5 by Fruitcake from Deliciously sweet! 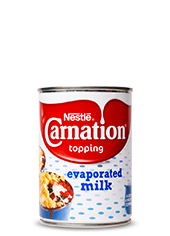 I buy Carnation caramel very often. It has so many uses and is so simple to prepare. I scoop out how much I need (in most cases all of It! ), then i give it a good old mix to make it smooth. Of course, if your wanting salted caramel, then add as many sea salt flakes as your taste buds require. I've used this product in tarts, on and in cakes, brownies, trifle, cookies, and cheesecakes etc. It's so easy to use, go for It! 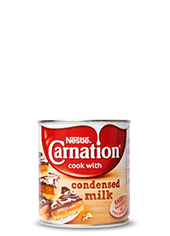 Rated 4 out of 5 by Nanny Moo from Great quick filling I found this product in my cupboard last week when I was in a rush to make caramel shortcake. It worked a treat and saved the effort of stirring the ingredients over the hob for simply ages, plus it so easily burns when you make your own. Rated 5 out of 5 by grl_watts from Bye bye to boiling sugar! I think it should be made official by the Banoffe Pie Board that Carnation Caramel MUST be used in the recipe at all times! 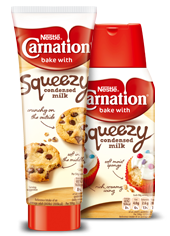 This product makes the whole baking experience a lot quicker without taking away from the taste. 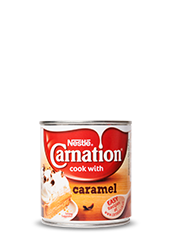 Making caramel can be a scary and lengthy process, but not if you're using Carnation. The cans I buy at my local supermarket even work out cheaper than buying all the ingredients to make my caramel from scratch. I recommend Carnation caramel to any fellow Banoffe Bakers. 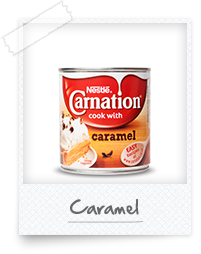 Rated 5 out of 5 by Chantelle from Banoffee pie Bought the caramel for a quick and easy desert and was so easy to make. Rated 5 out of 5 by Anonymous from Yummy. After finally getting my hands on a tin from my local asda I used the recipe for banoffee pie on the tin as a guide and used chocolate digestives for my base and also sprinkled some thin sliced almonds on top and drizzled some treacleificness all over the top of it them chilled it for 45mins it disappeared a lot faster though. Rated 5 out of 5 by Jacksmum from Quick filling for cupcakes I buy this and to be honest use it for filling cupcakes. Family like it in normal vanilla cupcakes for chocolates ones. My favorite is spread on top of apple cupcakes, just call them toffee apple cupcakes and they go down a treat and super fast to decorate too!